I’m just a little flattered and more than a little surprised that anyone cares about my process. And cared enough to ask. But you asked so… perhaps there’s a little part of you too that wants to see an example of how one goes about going from an empty canvas to something, anything. Or, maybe as a creative being yourself, you’re feeling stuck in one way of doing things and need a little nudge from the world outside your own head. If so, feel free to spend the next few minutes in mine! As a matter of personal growth (of course! ), I took on the task of approaching the particular project I’m sharing as a capacity-building exercise because I’m notoriously intolerant of “process” …you know, the messy thing that takes place between the moment you get an assignment/job/project/inspiration and the instant when you can check off the box next to it that says it’s complete? The images you see here is documentation of what transpired at the dining room table over a period of days, during a full weekend of family activities — including improvising makeshift beds for out of town guests, cooking and eating shared meals, napping with puppies, singing out loud, and hosting a sleepover for 11-year old girls. I discovered that a cure for the need to control the process is… CHAOS! 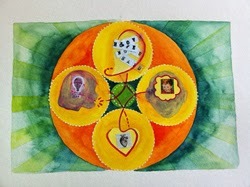 I was granted the high honor of creating art for a soon-to-be-released online offering created by three women I admire very much, experts in their respective fields who were stepping forth to bring together a body of work called Your Emotional Wisdom. I was more than a little daunted, because the content is so good, so foundational, so transformational. Of course, my little mental gremlin started up immediately and I began to doubt my ability/capacity to create a body of art that would do justice to this work. 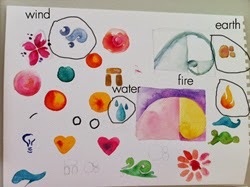 With Jen’s coaching, I shifted gears and made a conscious decision to “just play.” I told myself that nothing I did was with the intention of being anything other than quick studies… doodles that could potentially inform the vocabulary for something later in the week but in and of themselves were nothing. Make bad art!, Jen said. You can imagine how challenging this was for me to spend time doing something without a clear purpose in mind, a “waste of time,” when you know, who has time to waste? I had a deadline and 30 paintings to finish!!!! I read through the lessons for Your Emotional Wisdom. 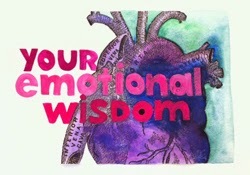 One of the concepts my friends, the instructors address, is that wisdom is held in our bodies and in our emotions but all too often, we are stuck in our heads. Hmmm… sounds familiar. What answers and solutions could come if I were to move out into my actual, physical body? Okay, I’m game, in part because I was truly stuck the other way. I don’t know about you but my gremlin lives in my head so at the very least, I might escape the inner critic long enough to get something, anything down on paper. I took my paints and papers out into the dining room where my aunt and daughter were crafting together and absentmindedly dabbed at colors while listening to their chatter and my daughter’s Pandora station set to Pitch Perfect. Once in awhile, I’d browse through their beadwork magazines and let myself be inspired by their stack of plastic containers full of candy-colored beads. I took the dog for a walk, pulled weeds from my fledgling flower bed, and snapped a couple of pics on my phone of the clematis climbing the back wall and a few of the daylilies that had finally burst open. 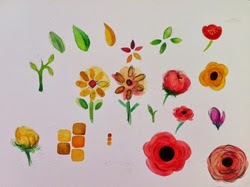 Flowers began to weave their way into my sketches. I did a “body scan,” as the instructors of Your Emotional Wisdom suggest… softening. opening. unfolding. radiating. 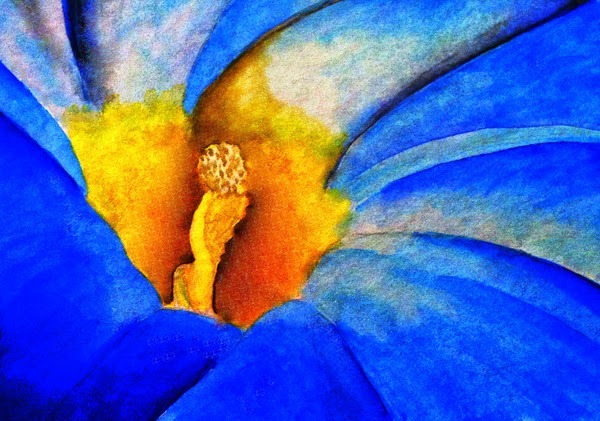 More flowers… a morning glory (my grandmother’s favorite)… with a secret glowing star in each bloom. This is what drew Georgia in, I imagine, the intimations of vast universes held within. I kept on, allowing my feeling body to lead the way down a path that seemed so much less effort-filled, and noticed a style beginning to emerge. What do you know! My body did have an answer after all! Here’s where I ended up! … now to do 30 more!!! Do you have a creative process that’s working for you right now? Do you work with your body and feelings too? That’s right. I am asking… and curious and interested in your process… and wildly grateful for YOU!